The Plymouth City Transport Preservation Group has today created what is believed to be another first in the field of bus preservation. 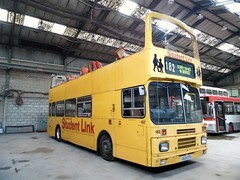 The group recently acquired a pair of recently withdrawn Plymouth City Bus yellow "Student link" buses for onward preservation, today we can reveal that one of the pair has been converted to open top format for use on trips in the busy summer rally season as well as performing a vital tree lopping role for Plymouth City Council in the Autumn and Winter months. The conversion, carried out at our Colebrook depot, lead by Group Chairman Ralph Delbridge has created a much needed additional open top facility for the group taking the pressure of its other existing preserved 1960's Leyland Atlantean open topper and also providing the City of Plymouth with a vital service vehicle to keep the bus lanes free of the danger of overhanging branches in the future. Group Chairman Ralph Delbridge added "Whilst we actively preserve the Public Transport of the past for future generations to enjoy, it is equally important that future public transport connections are developed and we are pleased to be able to play an important part benefitting both the travelling public and local Bus Operators. Our sincere thanks to Plymouth CityBus MD, Richard Stevens and Engineering Director Mark Horide in their open support of our Group in the acquisition of this and other former service vehicles. " The bus was originally one of a batch of 19 Volvo Citybuses purchased second hand from Trent and other operators in 1999 to replace the remaining elderly Leyland Atlanteans and modernise the fleet. The remaining half dozen or so left of this type of bus which were all Student Link liveried examples with Alexander bodies were withdrawn in July 2013. Will it retain its upper front window?